The court ruled that federal officials violated the Endangered Species Act by failing to complete its consultation with the U.S. Fish and Wildlife Service on the impacts of offshore fracking and acidizing on endangered species, according to Monsell. I have requested a comment on the ruling from BOEM, but I haven’t heard any response yet. While fracking and acidizing in state and federal waters has been halted for the time being, traditional methods of offshore oil drilling continue in state and federal waters off the California coast. On September 8, Governor Jerry Brown signed two bills, SB 834 and AB 1775, to block new federal offshore oil drilling along California’s coast, but consumer and environmental justice advocates pointed out that he needs to also to stop his expansion of new offshore drilling in state waters, where Brown controls four times the number of wells that the Donald Trump does. 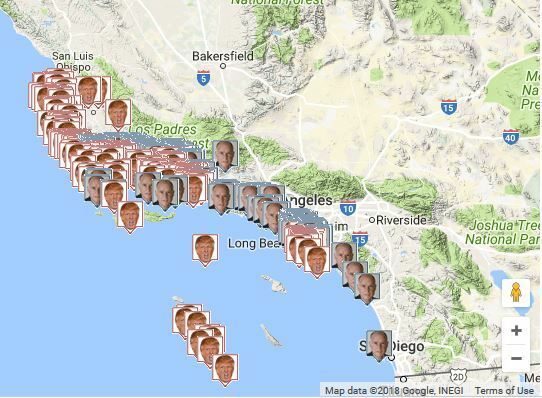 An online map at www.BrownvTrumpoilmap.orgshows all the state offshore wells under Brown’s control vs the federal wells under Trump’s control, with geolocation data for each. Over 800 public interest groups have called upon Brown to limit neighborhood drilling and freeze new oil permits before he leaves the Governor’s Office in January and Gavin Newsom takes the helm. Brown has refused to do so to date. Read more at www.brownslastchance.org. The vulnerability of the California coast to an oil spill was demonstrated during the Refugio Oil Spill of May 2015, when over 9 miles of the Southern California Coast, including four “marine protected areas,” were fouled with crude oil from badly corroded pipeline operation owned by the Plains All American Pipeline Company out of Houston Texas. A jury found oil pipeline company Plains All American Pipeline, L.P. (Plains) guilty of one felony and eight misdemeanor counts in the Refugio Oil Spill of 2015 that fouled over 9 miles of coast. Ironically, in an apparent conflict of interest, Catherine Reheis Boyd, the President of the Western States Petroleum Association, the lobbying organization for the Plains All American Pipeline Company, served from 2009 to 2012 as the chair of the Marine Life Protection Act(MLPA) initiative Blue Ribbon Task Force to create marine "protected areas" (MPAs) in Southern California, including four MPAs being fouled by the spill.